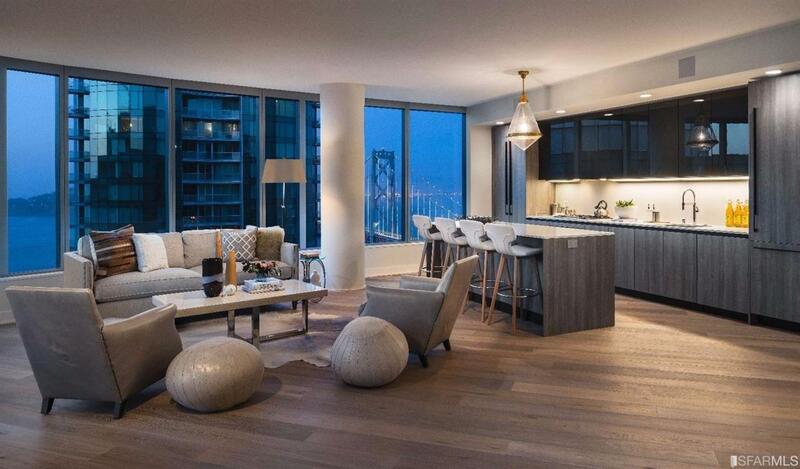 Designed by Bernardo Fort-Brescia of Arquitectonica, LUMINA is a brilliant take on premier living in San Francisco. At its pinnacle, discover the city's most refined Top Floor Penthouse spanning half of an entire floor with 270 degree panoramic views rom Bay Bridge to Twin Peaks where you can enjoy sunrises and sunsets and watch the City light up at night. Built out to meet meticulous LUMINA's specifications, this home includes two private balconies, a climate-controlled wine room and wet bar, MAAX soaking tubs, marble countertops, KOHLER bathroom fixtures, custom cabinetry, quartz countertops, and GaggenauTM and BoschTM appliances. Community amenities include: a private dining room, Jay Wright-designed fitness center, 70-foot heated lap pool, private screening room, and children's playroom. 2 parking spaces and storage locker. Listing provided courtesy of Garrett Frakes of Polaris Pacific.